In India, the food-grain like rice and wheat and other pulses are consumed by the people from the market and from the Public Distribution System (PDS) shops. It is produced largely with chemical fertilizers and pesticides; hybrid and genetically modified seeds; high energy-intensive food processing and fossil fuel consuming transportation. So what we eat is neither safe & healthy nor climate friendly. Such food items hold only carbohydrate based calorie. The important nutritional value like calcium, iron, protein, fiber and vitamins are absent in the daily consumption. The food grain prices are largely controlled by the market forces in which neither producer nor consumer is benefited. On the other hand, It has environmental cost which is never been counted but has large impact like climate change. At the same time the contemporary diet practices also produces lot of food-waste and packaged waste which further aggregate the GHGs emission. 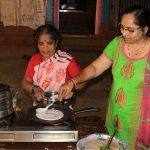 It is also observed that the traditional diet and recipes are getting lost and forgotten wisdom among the common people both in rural and urban areas. In the above given context, the traditional food-grain and food that is produced-marketed-consumed at local level; dietary habits based on consuming seasonal food-grain, vegetables and fruits; occasional meat consumption; clean but least packaged food would have considerably lesser impact on the environment and climate. 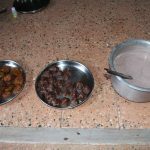 The traditional food system had emphasized on consuming variety of millets; seasonal fruits and vegetables; homemade dairy products and juices. 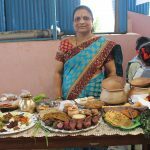 This was more nutritional, economical and ecologically sustainable food practice observed in Indian Societies. 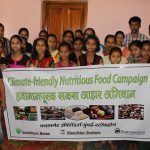 We termed it as SUSTAINABILITY DRIVEN LOCAL FOOD SYSTEM (SDLFS) as a title concept to work under the project for Asia Common Activities Focuses on women,School Children.In the year 2017, we organised series of lectures on nutritional food intake practices by the Nutrition expert. There was also demonstration workshops organised on traditional and locally available healthy food recipes. This process was further enhanced by organising couple of big events like Wild Vegetable Festival, Millet Festival and Traditional Food Festival. There was a tremendous positive response received all over in the project areas both in Mumbai and Devrukh region. 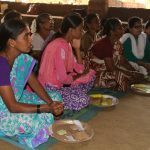 The children and women started knowing and practicing on consumption of local-traditional-comprehensive nutrition based food. 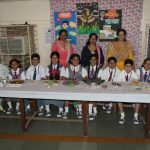 Wild Vegetable Festival in A. S. P. College, Devrukh.